Madame made an interesting… thing for entrée. It wasn’t really a soup. It was a rich filling of sorts, made with mushrooms and crême fraiche. I asked her what it was. She explained that it’s usually inside a crust of some sort, or there are croutons on top of it, but not when I’m around! It was delicious, but incredibly rich. We had thin, quick-seared pork cutlets with onions and a mix of vegetables (including carrots, peas, and potatoes) for plat principal. I could barely finish it because of how rich that entrée was. Madame laughed. “It’s okay to leave things on your plate if you can’t finish it.” “But it’s too good!” She asked what Mme. De Lapisse makes for dinner, I told her about how it’s usually the same handful of things all the time. Mme. Remion said she takes a lot of pleasure in making true French meals (different ones all the time) for her students to show them what real French food is like. This is why I miss her. There’s only so many times I can eat galettes du sarrasin with the same dang things inside of it… She laughed. We had the camembert, bresse, fromage noir, and some comté for the cheese course. Madame said the same thing Mme. De Lapisse did a few nights ago, taking French cheese home (especially comté) shouldn’t be too difficult. She suggested putting a sugar cube on top of the comté (but never powdered or granulated sugar) so that the sugar soaks up the water in the refrigerator around the cheese and the cheese stays dry. It turns out I brought just the right amount of pastries from Helmut Newcake! We had the chocolate chip cookies for dessert, followed by a clementine and some coffee. I’m now thankful for the French press I have in storage near my college. Looks like I’ll be using it after lunch every day… when I eat lunch at home, that is. She loved all of her little gifts. We tried all of the almonds, and she said that I’ve turned her into a gourmande, which I deflected since she was already a gourmande before I ever came into her life. “Perhaps… but I know more about almonds and jelly beans thanks to you than I ever did before!” Madame talked to me about my final project for Mme. Hersant (the Le Malade imaginaire one with all the costumes and set designs). I showed her the drawings I’d done, so she gave me some feedback on how to set up my set design (from a spectator’s perspective) and she loved the ideas I had about portraying Paris and the Parisians to my American audience, namely how there has to be a character that walks in with a baguette in his or her hand, and someone’s got to come speeding in on a trottinette (scooter). Madame found that last one hilarious. I told her it’d be normal if I did that and produced the play here, but to an American audience, that’d put everyone in stitches, especially where I intend to put it. Madame had one final gift to give me. She makes these little recipe books as Christmas letters every year that she gives to everyone in her family. Each book has the actual letter at the front of it, recounting everything that’s happened to her in the year (birth of a grandkid, things like that), and it’ll have about ten recipes in it, each with her little “mon avis” (my opinion) note at the end of it, even a little story if there’s one attached to it, like how she got the recipe, or if it happened to be her husband’s favorite homemade tarte or something to that effect. She had an extra copy of the 2006 edition, so she gave it to me! We talked about some of the recipes inside it, namely about one very French merengue recipe. I told her that I’m a merengue whizz which has earned me some serious respect among my friends and family since most Americans are too scared to attempt to make it. “You’re kidding! It’s easy!” “I know!” I went back in my room to finish packing, and when I came out to look out the window at the winter landscape, Madame seemed to be working on another one of her recipe books, and I was right. She was making a copy of the 2010 edition… FOR ME. She’d printed out two extra specific recipes (one for a flourless cake make with almond flour, and another for her favorite plum tarte with the stories that went alongside them) and given them to me already, but she wanted me to have the whole book for 2010 because it had a lot of history to it (that was the year her Maxence was born, and the year her husband died). New mission when I get home: Make up a set of MY favorite recipes (with the goofy stories that go with them), convert them to the metric system, and email them to Madame so she can have her own little pieces of me in her kitchen like I have from her. The train ride wasn’t too bad. When we were about halfway to Paris, we stopped at Amboise, and a young woman came into my car (there were already three people in it with me) carrying her suitcase… and a Beagle. I was actually quite amused with the pooch. The woman had the dog on her lap for the whole ride, he was quiet, and he behaved. That’d never happen in America, not even with Noah. I’ve done a wonderful job with Noah, he’s incredibly well trained. I know for fact I can get him to sit on my lap, or in the seat next to me indefinitely, and he’ll be quiet and behave indefinitely. Noah, however, is in the minority. In America, if you bring a dog on a train, it’s in a crate, it’s in the cargo hold, it’s luggage… people give you dirty looks if you walk in a train car with a dog in America. The woman walked in our car with this dog, and we all smiled. I’m definitely going to miss that about France… people are respectful dog owners here (except for the picking up after the poop thing). I’m probably going to be one hell of an annoying dog owner back home… I’m anticipating getting myself into a lot of trouble telling people to put their dogs on leashes or to get them properly trained. Oh well… We ended up making it to Paris Austerlitz about 20 minutes later than expected. I made my way home, and by the time I got there, Mme. De Lapisse and Sheila were about halfway through dinner. As soon as I came it and went to my room to put down my bags, Madame started making my dinner… a galette du sarrasin with egg, cheese, lardons and mushrooms. I suppose I had that one coming after I had complained about them to Mme. Remion… I told Mme. De Lapisse all about Mme. Remion, so that was nice. Sheila and I caught up on each others’ weekends. It’s hilarious how neither of us knew each other before we came here even though we go to the same school, and we have withdrawals when we spent a weekend apart! It looks like we’ll be great roommates when we go back to California. I’m definitely looking forward to it. Très dynamique. That she is… she always has been, and she always will be… until the day she passes… no, past that. She’ll always be dynamique in my memory. That’s the best way I can keep her alive, in all honesty. I can strive to be just like her in everything I do: dynamique. L’âme est une chose si impalpable, si souvent inutile et quelquefois si gênante, que je n’éprouvai, quant à cette perte, qu’un peu moins d’émotion que si j’avais égaré, dans une promenade, ma carte de visite. 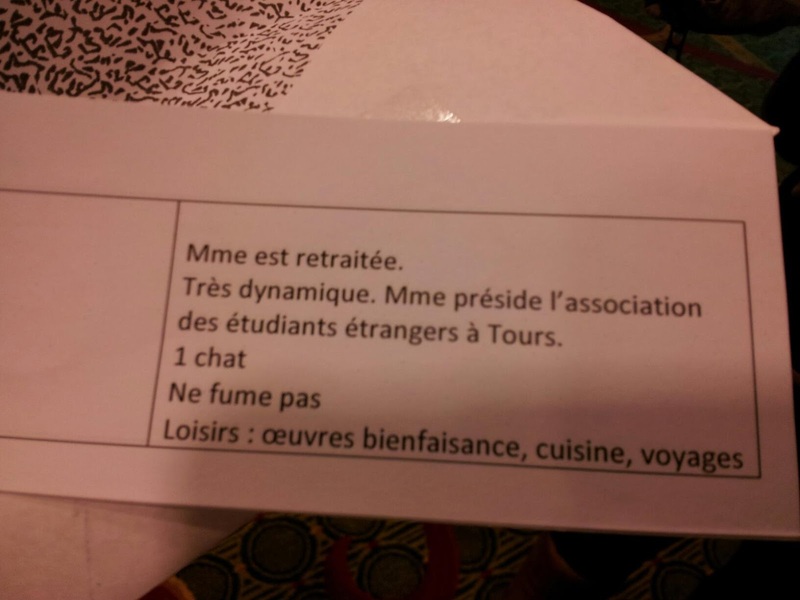 This entry was posted in almonds, food, France, gift, goodbye, host mom, paris, Tours. Bookmark the permalink.